Arris has tapped G.hn as its technology of choice for easy powerline-based network building for those whose homes are not graced with Ethernet drops in every room. Our review of the SBR-AC1900P router found weak 2.4 GHz and meh 5 GHz wireless performance, so perhaps it's good that easy network extension is built into the RipCurrent family. 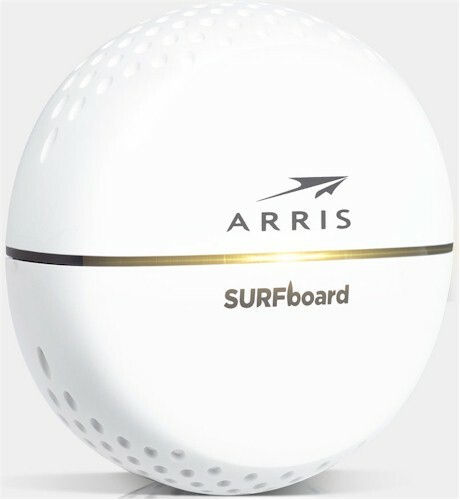 This review looks at Arris' SBX-1000P SURFboard Wired Network Extender with RipCurrent, which is Arris' option for bringing Ethernet to any location with a standard AC wall outlet. We'll also be reviewing the SBX-AC1200P Wi-Fi Hotspot with RipCurrent separately. The SBX-1000P adheres to the circular design format established by the SBR routers, measuring a little less than 4" in diameter and a bit under 2" thick, not counting its three-prong AC plug. The photo below shows that even with its circular design, it won't block the top outlet in a standard U.S. duplex outlet. The LED decoder table taken from the User Manual shows how color and blinking are used for both the Link Quality and Pairing LEDs to indicate connection quality and network status. The adapter ran warm to the touch and doesn't appear to have a power-save mode. The SBX-1000P uses Marvell's G.hn solution, which has separate baseband and analog front end devices. Marvell's device uses MIMO via the power outlet ground pin, just as HomePlug AV2 MIMO adapters do. The case was a bugger to get open, so there are no internal board photos. The component information was taken from the FCC ID photos for its sibling Wi-Fi extender, the SBX-AC1200P, which will be reviewed separately. The AC1200P shares RAM and Flash between its Wi-Fi and G.hn components, so the capacities in the table are based on what we found in Comtrend's PG-9172 G.hn Powerline Adapter.